High jinks from Paul Holleran and physio Pete Denton as Brakes prepare to welcome Salford City to the pitch with a guard of honour. Paul Holleran says Leamington retaining their National League North status was a bigger achievement than when they finished 13th in 2013/14. 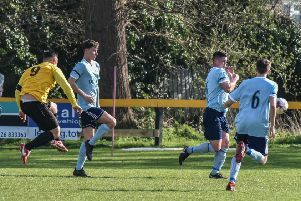 With their survival already assured, Brakes suffered a comprehensive 4-0 home defeat to Salford in their final match of the campaign on Saturday to finish just one place above the drop zone. However, despite finishing three points and six places worse off than in their breakthough season, Holleran said the increased strength of the Conference put this campaign’s survival on a higher plain. “Even though the first time we were in this league we got around 50 points, this achievement has been better,” said Holleran. “The National League North is very close to the National League Premier. It’s not a million miles away. Next season there will be more teams going full-time. Southport and Telford will be full-time teams and full-time Chester and Guiseley are coming down. “It’s going to ask a lot of questions but this season asked a lot of questions. “This achievement is as good if not better than the play-offs last season but we’ve got to find a way to improve the squad. Seven successive defeats in August meant the threat of relegation was always hanging over Brakes. And Holleran said that while some of the teams they were battling it out with in the lower reaches had the financial clout to bring about a turn in fortunes it was much more of a gradual process for his side as they scrapped their way to safety. “We played Southport over Christmas and they had splashed out £125,000 on transfer fees alone. You see what some clubs can do when they find themselves in a position near the bottom. “We brought in Kieran Dunbar and he gave us energy and legs. Jack Edwards coming back gave us physicality and a threat in both boxes plus it lifted the place as he’s well liked. However, while Holleran was keen to attribute their improvement to a series of small things, he did highlight the influence of one player. Dan Udoh scored just four times in his three-month spell on loan from Crewe Alexandra but his presence and workrate was key to Brakes’ survival, according it Holleran. “You look at the £50,000 (Southport) spent on Jason Gilchrist, that’s what goes on. “We got a young lad on loan who didn’t cost a lot. “I was out watching the boy in December time and we were able to do a deal with Crewe.